September 12, 2018: Cremate me and consume my ashes in pancake batter. 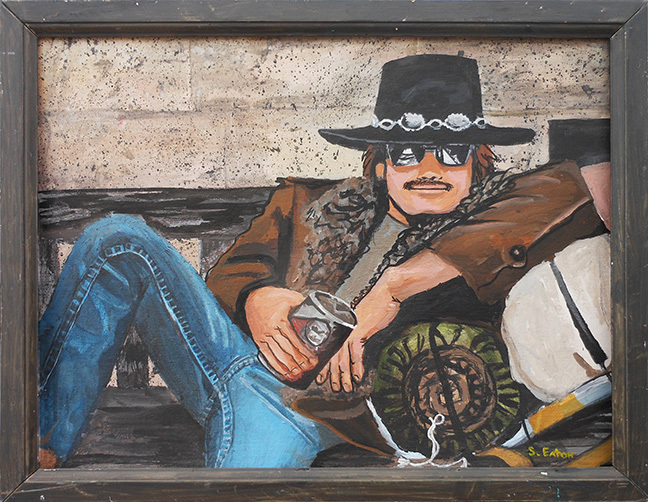 Dunno who the guy is in the painting, but he stole Stevie Ray Vaughan's hat. @chris, up here in the upper left, the smoke has finally cleared. Isn't that (a young) Burt Reynolds in the painting? "The Procrastinator" is an incredible name for a posthumously released album. Yowza, hearing Cactus brings back so many memories, thank you Irwin for allowing these sound vibrations to enter the ether once again! Could you play something by Down with Culture? I must've seen Cactus a dozen times in concert. Fave band in early '70s. Loved the Bogert-Appice rhythm team. I was just going to ask you how you felt about Vinny Appice as a drummer. I liked Cactus too. And the album they did with Jeff Beck. oops. and I thought Jim McCarty WAS Jeff Beck when I first heard Cactus. Never saw them live. Vanilla Fudge? Irwin, your show rocks. Man. Vinnie was the guitarist in the Fudge. Mark played organ, mama sang tenor. Geez, I think I just dodged a mullet. Tuned in late today and just missed Jeff Lynne (dammit) but I get to listen to the DJ speakin'! Howdy Irwin! Just watched the Scorsese Harrison doc. Highly recommend it. Jeff of course makes an appearance. Wasn't it Fatburgers where Descendants ordered for "I Like Food"? Didn't know much about Cactus back in the day. I dug their track on the "Mar Y Sol" fest album, but then, I dug every track on that album. I remember Beck Bogart & Apipice but never actually heard their stuff. I did know that Carmine Appice was part of the Big Brawny Rock Drummers Club in the 70s. This does sound a heckuvalot like Mr. Bruce. Diggin' the Japanese Breakfast, even though I really do not care for Natto. Agreed! Very Bruce-ian -- the bass and voice. The bass player has the 60s/70s distorted bass tone dialed in. I would say being mistaken for Jack Bruce is a compliment. I've been reading upward and an old question came to mind: is it pronounced Ah-piece or Ap-ah-See? A shot with a wine chaser sounds just fine. I know a guy that was replaced in the band Masters of Reality (John Leamy) by Ginger Baker. He said he was honored! Millions of other young drummers and I learned "the rock beat" from Carmine Appice's "Realistic Rock Method" book! This sounds like the beginning of YES's Close to the Edge in the backgroud. Appice plays around here sometimes, a local bar. I know he has a really big drum set. @coelacanth: yes: they have really big drum cases ! In the Now Generation, everyone plays sitars and bongos. I was a hippie, but I wanted to be a beatnik. ?, yes that! but what i'd heard was that they don't play the whole thing. maybe that's just sour grapes talking. I feel like I'm one of the Then Generation--but by Then I don't mean the Then that was Now at the time of the Now Generation. The Then Generation plays digeridoos and waterphones. Lucinda's playing near me soon. maybe i can go...and cry in public. I have actually seen Luncinda live on several occasions. And I don't generally leave my apartment unless absolutely necessary. 9/8 time in a 5/4 groove. In the Future the EAS sounds just like the Red Alert siren on Star Trek. They think it sounds dumb too. This Patti track is practically sacramental. "Land" sounds different. Is this a remaster? sounds different here because i'm listening via laptop speakers. the bass part is left to my imagination. I have "Horses" in many formats, but have mostly listened to it on vinyl. Could just be a CD I suppose. I still have my original vinyl copy from 77-ish. It's as beaten up as you'd expect but I don't want to part with it. I saw P Smith in the 70's come on stage w/ William Burroughs. She was a shaman possessed. i dubbed horses from record to cassette around 1978 so the record presumably is in good shape. that tape is how i usually listen to it, though i've played that track on the pub's jukebox several times. Never saw Patti, I regret. My college radio station did an interview with her early one. She said that she personally ran the board to mix "Land". She did an ID for the station in which she urged the listener to "Be a saint in any form." yeah LLife... a bit envious here. i never saw her until c.1998 at the guinness fleadh. she was amazing then and politically driven, but of course not the same thing as the original Patti Smith Group. i.e. this set is brilliant. @LL: What? Not even chicken-wire? i've said it before but again, i'd like there to be the ability to goldstar sets on the fmu playlists. My cats say the same thing! Oh, you twitchy clickers. You probably photograph your food, too! Harrumph! ex-cuuuuuse me, βrian i am NOT a twitchy clicker! i only click stars for songs and episodes for my own future reference. Well, don't get your knickers in a clicker. How long till Van Dyke and the Lemon Twigs get together? of course you are right, Kenzo. like starring favorite shows/playlists, starring a favorite set as a whole would be another tip-o-the-cap to the DJ, rather than all the artists in the set. I wish I could play my favorites list in a music player. As a continuous playlist, I mean. chris, exactly. not for the songs specifically, but for the talent of composing the set. we do not have the means to do that. Optigon Pea Hicks???? Mad props for the sophisticated mashup. ^ that reminds me: isn't it almost time for another marathon ? Yep, same Pea. New OY album out, btw! Again what Chris said. The TTs should totally have worked with Claudine. Fuzzy, yeah, wouldn't that be cool? @Parq: maybe some kind of script that parses the favorites list into a YouTube playlist -- I'm sure it could be done! yeah, soundcloud, youtube, google/apple, etc. export the favs in a format that can be imported or instantly used elsewhere... oh, that would be sublime. Yeah, it's high time we do some magic with those clicky stars. There IS an export but it's not like raw data. but not youboob! some platform less cumbersome and less despicable, perhaps? I'm feeling old and it is near the end of the day so I really appreciated the slowed down Sly. All the music is already on the WFMU archive servers, but it's hard to cue it up precisely. @Fuzzy, i'm sure there would be licensing headaches involved. If I didn't know the tune, I'd think this was Killing Joke. @Fuzzy etc I had been working on a favorites-> playlist program ..because you can email your faves to yourself, I scrape the email. @Henry: ah -- thanks for the hint! I want to play other people's favorites too, if publicly available. Thanks all for doing my research. See you at the PLU show mebbe. See the Sept 11 Wall Street Journal ( of all places ) for an interview with Ms Jett. she'll be at the theatre in Williamsburg on Friday, Sept. 21. prob the best time, if its not sold out already. sadly, i'm on the wrong side of the country. i'll have to wait until she comes to SF. @Kenzo ideally, the ItchyBunny robot would play selections from your favorites and back announce them. hello. had to log on to say i like this owl fellow. if the randomatic page could scoop up favorites, that would be enough for me. i don't think i need the back announce. but, hey, who am i to complain about such features. @Kenzo -- nice. It even includes an entire Shut Up, Weirdo show as a nostalgic bonus! Mark Eitzel I love you! thanks, Irwin for the tunes. thanks, folks, for the conversation. @chris scope creep is my middle name! Or my epithet.